Yesterday in class, my students and I discussed the function of memory in multiple modes of storytelling: fiction, nonfiction, and metafiction. Thursday of this week marks a year since my grandmother’s death. My brain and heart have been locked in a continual struggle for the past few weeks. It began on Christmas Eve when I couldn’t stop thinking that, a year ago, I should have called her on her last Christmas, but I didn’t. On Christmas Eve, I was a physical and emotional mess. I didn’t want to be around anyone. I couldn’t stand being in my own head. I couldn’t stand thinking, because every thought led back to the memory of the morning when my mother called me and told me Ma had broken her hip and would have to have surgery. Every reminder of her—there are several in my home—led to the memory of the exact moment when I knew my grandmother would die. I remember where I was: my living room, playing with my son. I remember the sound of my mother’s voice, and the way my thoughts slowed down: she is too old to fall and break her hip; she will not make it through this. I remember the way my mom, despite the reality, tried to soften the blow: things look good, she’s going into surgery. I remember her home—for all intents and purposes my childhood home. I remember her yard. I remember knowing beyond any doubt, in that moment when my mother told me she had fallen, how it would all end. All of this is true. What is not true is that if I had just called her last year on Christmas, it would have altered the whole series of events. One phone call could have made the difference—what if mine had been that call? No matter my anguish, or the ferocity of my wish to have her here, to have had the chance to introduce her to her great-grandson, it is undeniably true that were she still alive, she would be suffering, and in pain. My spry, feisty grandmother would resent the confinement of a hospital or rehabilitation facility. She would resent immobility. Daily, I resent my lack of memories. I can, in my mind, recreate her home around me, inch for inch. I can recreate her yard, her beautiful lilacs—my paradise, now gone to make room for a housing development—just by closing my eyes. 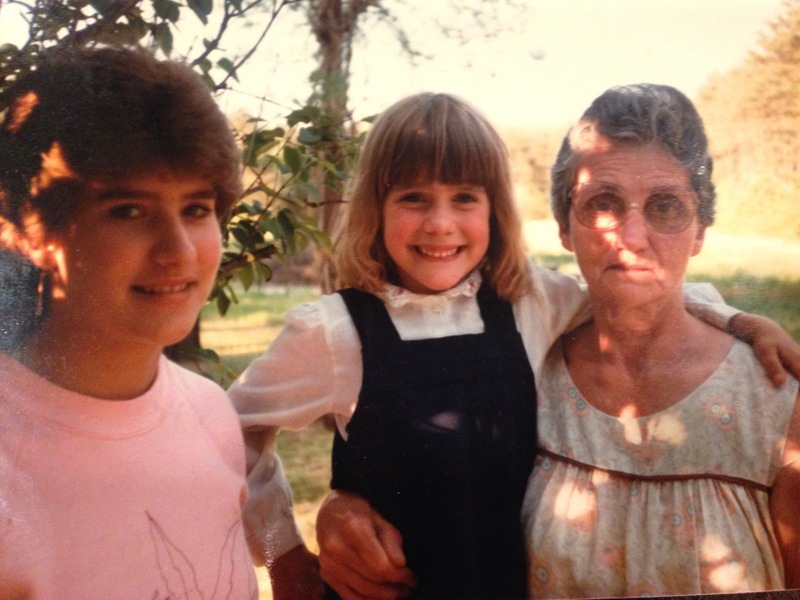 What I want, though, is the clear memory of the day on which someone (likely my mother) took a picture of my grandmother, my sister, and me together in the shade of her lilac bush. All I have is the picture. I do remember sharing afternoons with my grandmother on her back porch, swinging slowly in her glider, talking of whatever. I remember the smell of fall and how she burned leaves in a fire crackling in the carcass of a burned-out barrel. I remember her humming. I remember some of her stories of childhood. I remember her making snow cream. I remember the oddity—and the smell—of her ice crusher. I remember the smell of her. I remember my grandmother as I knew her. I feel like now, instead of holding those memories for reflection, I am squandering them. I feel like some of the memories are already slipping through my mind like water rushing through a sieve. I want to write every one of them down, preserve them for all of the rest of my days. But I worry about not remembering everything right, about not being able to perfectly articulate what it felt like to be loved and cared for by one of the strongest women I have ever known. I feel like my student, the one not able to tell what is real anymore. Even if memory is a reflection, it is such a very poor substitute for reality. It is such a limited way of telling the truth. This entry was posted in Life, Thinking, Writing and tagged Death, dying, grandmother, Grieving, life, writing by Heather Wheat. Bookmark the permalink. I agree but I still keep my memories written down in my diary for reference. I’m glad to hear that 🙂 We need to have lunch sometime! Wonderful entry — I’ve always been fascinated by memories and the weird ways memory works and doesn’t work. I think writing down everything I can remember is important, but at the same time, who can do that? And memories are changeable and not always so trustworthy. I think that’s why I’m so obsessed with photography too. I loved the entry about your grandmother after she passed away. It brought tears to my eyes and I don’t think I ever left a note about it. Thank you. What unnerves me so often is that I look at pictures and can’t recall who/what/when/where/why…I wish pictures could do more for holding memories in place. What an awesome blog. May you have many great memories to keep writing about! Look forward to seeing more from you. We have a lot to learn from you! Your last line is my favorite for the very fluidity of memories. There are occasions an image invites a distraction entirely unrelated to the framework of a singular moment and memories that send me scavenging for a context of intimacy preserved in photographs. Lovely remembrance. Memories are the most precious thing to me which is why I take an excessive amount of photos and videos of loved ones. Wish my brain was more capable of retaining information. Even my computer is struggling and constantly running out of space for my photo and video files. This post certainly resonated with me. This is pure beauty. I needed so much to read an entry like this one. It’s not often that an article moves me to tears. I guess it hit too close to home. Not because I have had a loss, but because I know I have not done enough to make beautiful memories with the people I love most. I’ve been stuck in an autopilot state, and i fear I will deteriorate if I lose anyone at this point. I haven’t put in the effort to experience the relationships i have. You have inspired me to make the effort to cherish every person I love so that I may make memories that will evoke happiness and grattitude when i reflect on them. I try and read stories like this without crying and I never live up to the challenge. You sure made me miss my own Grandmother. Thanks for sharing your story! This is why we should always keep in close contact with family members and close friends. The memories with them last a lifetime. What is life, but a collection of small moments and small memories. It’s never the big things or realities that we remember, it’s the little things, softened by the blur of our emotions. I wish you peace and more memories. Your Grandma would be proud of you. Beautifully written. Definitely teared up just a little bit reading this… because it reminds me so much of my own grandmother. Beautiful post. I lost my grandmother almost 4 years ago and it doesn’t seem that long. I cannot believe it has been that long since I have seen her. I have dreams about her but I think they are memories because she looks younger in them. Keep those memories intact and written down. I used to be sad when I heard elvis because that was her favourite singer and now it makes me smile. Reblogged this on Matt, post modern.. I resent my lack of memories too! I’m been writing down the odd memory or two that floats above my subconcious but I’m always greedy for more. Sometimes I think we’re wiredxto to have detail long term memory because most of us would live in the past and not with the future. This is often how I feel about memories. I don’t want them to get lost amidst all the new things happening in life and the many more to come. I hope I can preserve the truth in the special ones. This is so beautiful. My grandmother passed away, it will be 2 years this year in June. This made me think of her and i related to it beyond words. I remember getting that call from my Mother and its sad because i was pregnant with my daughter too, i didnt even get to tell her she would be a great-grandma again. It breaks my heart. I truly loved this entry. Its so well written and i feel every emotion you put into it. This hit home making me thinking of my grandmaw and when we got the call. I miss her daily and cant wait to see her again that glorious day. Thank you for your wonderful memories and sharing them with us. God Bless.. Thank you for the beautiful writing, remembrance of your Grandmother, of the complexity of family, and for putting me squarely in that space, that anguish, that vulnerability, that bittersweet knowledge that there is nothing to be gained in hindsight, but impossible, or nearly so, not to go there anyway. Peace, love, and comfort to you and yours. Reblogged this on The Observations of Jaco. This was gorgeous and I thank you for writing it. The last couple of lines really hit home for me. It’s why I’ve been making myself keep a journal, no matter how hard it may be to stay focused and to write each day. I’m sure your grandmother is looking down at you and smiling, wherever she may be. This was such a lovely, heartfelt read. Made my night. Thank you so much, once again, for writing this. My mother died three weeks ago and your entry is as if my daughter had written it about her grandmother. It is beautifully written. Peace and gentile days going forward. This January 17 was a year of my father’s passing… I have an idea of what you are going through. These are touching memories, Heather, beautifully told. Reblogged this on Umair Aziz Ashrafi. Thanks for sharing this powerful peice of writing! I feel that often as well… Squandering onto memories. beautiful truth! bless your journey. This is so on point. My uncle passed away last December. I published a post about grieving his death about an hour ago. There is so much to say about our loved ones’ lives but putting these t to words is a difficult exercise. Sometimes, it is just much easier to write about grief. Many different ways to express the inner feelings. I enjoy my time here on WordPress from the openness of many of the bloggers. Memories have a way of delicately intruding , and suffusing us with emotion . I really enjoyed reading through. This is beautiful! My nana is my best friend! I identify with this so strongly. When my grandfather died after the long, slow decline of dementia, I really struggled to draw on any clear memories of him in good health. In fact, for months all I could picture was the photo on the order of service from his funeral. I think grief definitely clouds our ability to recall happier times, as now it’s very different. I can close my eyes and return to the age of 5, sat in a wheelbarrow, being pushed around the garden my grandad, both of us in hysterics, with his old dog chasing us round and round. I don’t think memories really fade all that much, there just clouded at times by everything else. IMHO memories are stored in our Personal Energy…whether we realize them in our minds or not. Thanks for the beautiful post. Reblogged this on pjsecluded's Blog. Capturing my mother’s spirit in writing not only keeps the memories vivid but serves as a document for future generations who were deprived of knowing her. And, just when you feel you are forgetting parts of your wonderful grandmother, at some point in time with no notice, a memory will emerge, beautiful, crystal clear and unfading. This was so so beautiful. I stumbled across your blog as a new wordpress memeber. It reallt struck a cord with me as my mother returned to her home in NJ from california where my boyfriend and our two children live. I sometimes regret my decision of moving to califorina because my 91 year old grandmother is still alive in NJ, spry and living on her own. Still, this year i find myself as you said “recreating her house around me inch by inch” and cataloging specific moments in my brain. I try also to take a mental snap shot of her every time i say goodbye these days. After my second child the lighting speed at which time flies by is that more apparent, as is the heartbreaking and inevitable. Sending strength your way! What a wonderful text, it’s so important keep our memories. They can helps us build better relationship with our future. Thank you for your post, special today polish people celebrate Grandmother ‘s Day. Memories are such an odd entity. I often feel betrayed by my memories–“Is that really how that happened?” “Why can’t I stop thinking about_____?” Most recently, I’ve been trapped by my memories, or lack thereof. I was in a bad car accident, and while I think it happened one way, my memories are unreliable, because I was knocked unconscious by the impact. Almost consequently, I cannot stop thinking about the accident, trying to piece together exactly what happened based upon what I do remember. It is an unforgiving cycle. On the other hand, memories are such a blessing. You remember the lilac bush–I’m sure every time you smell the sticky-sweet perfume of lilac, you’re reminded of your Ma and your relationship with her. What a wonderful thing to experience. Reblogged this on Casa de Ortega. Memories take shape and become little bits of gold wrapped in pain and joy, quite a peculiar irony, when taken with the difficult task of existing in the present moment as awareness. Which quickly too becomes yet another memory. So touching and beautiful. I couldn’t stop my tears while reading this beautiful piece of writing. Memories are like old friends, they visit you sometimes with big warm hug or other times with hurtful recall. Whatever form memories come to you, grab and live with it in a moment. Reblogged this on Words of reckless abandon Sara Assumani. At least after reading this blog people should give more attention to their parents and grandparents and older people. You can fulfill their small wishes only when they are alive.No point in repenting after their loss. Reblogged this on Apps Lotus's Blog. A beautiful post. You’ve done a great job of describing how that yearning for an alternate world where we can change our actions and even, more wishfully, have our actions change what happens. I felt that way so often in the year after my husband died, and even now over 2 years later, still do. Embrace those stories and ideas, write them out, and accept them. Most of all, realize that the people you love know you do, and that a missed phone call or visit doesn’t alter that fact. “Even if memory is a reflection, it is such a very poor substitute for reality. It is such a limited way of telling the truth.” One of my “old” friends passed over the weekend. I have been nostalgically grasping at slivers of memory from my youth but I can’t seem to fit the pieces together. Thanks for your beautiful post. Reblogged this on I'mpossible Hope-r. This really struck a chord in my own memories of my grandmother’s passing caused by a stroke, which I’ve always wondered on the “what-if”s as well — she was alone when it happened and we were away visiting my other grandmother. Oddly enough, I had this nagging feeling to go home as soon as possible but my mom wouldnt let me. At the tender age of 7, I first learnt the word “death” a day after her stroke and it was this accident that truly drove the meaning of it home. The fallibility of memory and meta-memories, makes me worry from time to time if I may have remembered this important memory in any other way than it really happened. Brilliant entry! Beutiful!! Amzing! I love it. Reblogged this on M.T. Miles. life is really made of memories, we can spend an entire day moping around and cherishing all that we have gone through and still value them for what they are and what they maybe for us. I love your line “I remember my grandmother as I knew her.” This is how any of us remember those we’ve lost – as we knew them. And it does not matter if you remember ‘correctly’, matching someone else’s memories or life itself. What you remember was unique and special. Thanks for sharing. Reblogged this on ashhsaysheyy's Blog. Reblogged this on My Wonder Emporium. You wrote this beautiful piece three days after the 16th anniversary of the day I unexpectedly lost my beloved husband and the amazing father of our three toddlers, so I can understand where you are coming from with the worries about memories fading. However, there is one thing about memories that you are forgetting and that you have to look forward to in the long run that will be your life. There will be some days you will see something odd, smell a scent that reminds you of her, hear a song you haven’t heard in ages, or see someone that you haven’t seen since before her passing, and you will suddenly be struck with a clear, bright memory that is almost like a gift, a window into the past. You will relive, in perfect clarity, an experience you shared with her, even a simple one that meant almost nothing at the time, and it will bring a smile to your face and a sudden renewed feeling of the love you had for her bursting through you. Yes, sometimes a tear will come to your eye, but you will still smile at the memories of the wonderful woman you were blessed to share your life with. That is the blessing of memories, they are in there, somewhere, just waiting for the right trigger so that we can find them, again. Lovely post, i can really relate. My father passed away when i was quite young, and while i may have a handful of photos of us, where we are both smiling and obviously enjoying ourselves, i cannot for the life of me remember what led up to the photo being taken. What’s worse is when time passes and you become aware you are losing fragments, small details in the big scheme of things, but details all the same. Things you want to hold on to tightly. Oh! I am fighting tears. I’ll be damned if you did not just say exactly what i have been feeling for two years! Any time I have lost someone close I have been able to write about it – an essay about my best friend’s dad, poems for my brother, nephew and mother-in-law. On January 13th it was two years. She died in the rent house where I lived with her. We moved in together after my divorce. A year later she was gone. Instantly, the thought came that I should write about it but I couldn’t. I can’t. I so deeply want to. I even tried starting a novella about her last year and couldn’t even finish the first chapter. Thank you got sharing this and letting me know I am not alone! Reblogged this on HERO Network LLC. Death is so stinking final when it comes to words or memories. I’ve been thinking about my brother and the lack of words he left behind. I like your call to write down memories. Thanks for posting. Loved it! 34+ years ago my beloved grandmother went to her well-deserved reward. But the memories of her stay with me daily. Keep up the good work. Beautiful. I am paused. I am thinking. Beautiful writing, beautiful words, beautiful story. https://screaminggratitude.wordpress.com/2014/12/22/silence-tender-memories-of-being/….beautiful piece you wrote. I too share the fond memories of gliding on the back porch, idly listening to nature and life. Thank you for sharing. This is so wonderfully written and so very true. What a gift of insight. Thanks for helping keep things in perspective. Reblogged this on rahul01031993's Blog. Its really amazing how real you are in sharing your thoughts and emotions with the world. I believe we can make amends now that we’ve read this, those who haven’t had time with those they love,you know what do; lets value people. Remember that you are of great value to God and God wants us to value people as well no matter who they are.. Thank you for sharing these memories. I am also very close to my Grandmother, but this made me realize that i don’t have enough pictures and videos of her. I want to have more than my memory to remember her. But memories are richer than a piece of paper or a “screen” (videos). You just made a beautiful reflection of your relationship with her by writing this post and this is why it’s flawless. It is a substitute of the truth but a beautiful one. I agree that a diary is a great way to feel relief in knowing those memories are frozen there on the paper, but we also know life is supposed to move on and we can only live in the now. While it may be necessary to grieve, cycle through those times, and form bigger picture opinions, we must make it back to balance. The more we dwell on the past, the more we loose to despair and the more we dwell on the future, the more we fall victim to anxiety. There is only now and we can only take those moments with us through evolution of ourselves. Great post, it got me thinking :). fantastic ending.. powerful sentiment. Sorry you’re struggling. This post really hit home to me. My grandma passed away Christmas Eve a year ago, I have many similar thoughts. One thing I do have is a bunch of writing she did that no one knew about until she passed. I created my blog to share her words with the world, and I think you are doing a beautiful job sharing your memories. There are plenty of moments in life; that are too precious for words. The inability to describe the flood of emotion that consumes you, when you hear of a loved one dying. In death, brings a sense of aliveness; it triggers you to remember what it means to be human. To be living. How about the beat of your heart? Put your hand over your chest and feel that. That thing that thumps through your chest- who does it beat for? It beats for them, the ones you’ve loved, the ones we have lost. To then try to re live these moments- attempting to put pen to paper or fingertip to keyboard. To even endeavour to re capture the beauty and sincerity of any breath takingly beautiful moment, that happens in a flash; will be one of my greatest challenges and accomplishments in this life. An attempt to re live these memories through our words, through our senses. Like the smell of your Grandmothers ice crusher, or the way my mother held my hand. These fleeting passer-by’s, that come and go, so quickly, with the allusiveness to question whether any of it did actually happen; at all. What is life if not a collection of memories, some sweet, some sour! After I lost my parents, I suddenly realised that life means everything only when experienced in 3-D, and the moment death snatches away your dear ones, your past association with the dear departed souls amount to mere memory in a dream-like stance, never to be relived however hard you try – life is a mirage! Reblogged this on Imperfect Writer: My Journey to Finding Myself. I absolutely love how many comments you have. Memories are trigged and retrieved depending on what is currently going on in your life… at least that is how it is with me. If I’m under too much stress, things are more difficult to talk about, let alone getting the recall to happen. I’m glad you have the time and ability to share. It has to have helped on a few different levels. Peace and fond memories going forward. Limit your number of regrets as I am planning on doing so too. Reblogged this on Mithun563's Blog. I couldn’t help going down memory lane and relive the moments of pain, accomplishments, joy and laughter of the bygone days! What helped me was memory despite being a poor substitute for reality and it is one’s own memory which accompanies one on the lonely walk towards the inevitable sunset. A wonderful nostalgic post! Beautiful story! Thank you for sharing such a personal story. Reblogged this on Books Bazaar . Reblogged this on parish county.